Today, Kodak announced the final production run of Kodachrome film, after a 74-year run. 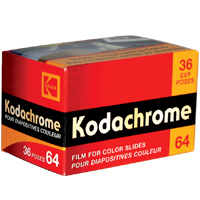 Kodachrome is yet another casualty of the long march towards digital formats, as fewer and fewer sales of Kodachrome film have meant continuing to mass produce it is no longer viable. This is a sad occasion for us, as we’re sure it is for many of you. While we understand the business realities driving Kodak’s decision, we are still sorry to see the film go. Kodachrome has been hailed as being remarkably color accurate, unique in its characteristic deep color saturation unmatched by other film formats, and praised for its longevity in storage. Properly cared for, most Kodachrome film has managed to retain its color accuracy despite decades of aging. One case in point is this circa 1949 image. Some of us who are way too young to have lived in this era, find it incredibly striking to find such a vivid color photograph, when we’re used to seeing numerous faded black-and-whites depicting the era. The rich color and depth of Kodachrome is owed to a unique and very complex film processing method, which differs substantially from the process in use for “modern” film formats. Dawyne’s is, at this point the only photofinisher up to the task, and Kodak is the only supplier of the chemicals needed to render photos from Kodachrome film. Thus, not only is Kodachrome’s days numbered, but the time runs short for those with unprocessed film to do something about it.